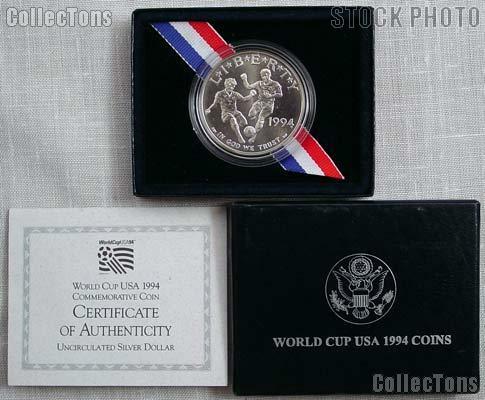 We are pleased to offer for sale this 1994-D World Cup USA Commemorative Uncirculated Silver Dollar. The World Cup Silver Dollar was minted in 1994 and is in uncirculated condition. The World Cup Silver Dollar was created to commemorate the 1994 FIFA World Cup Playoff. There were 81,524 of the World Cup Silver Dollars minted at the Denver (D) Mint. The World Cup Silver Dollar is comprised of .900 (90%) silver and .100 (10%) copper with a diameter of 38.1mm and a weight of 26.73 grams. The World Cup Silver Dollar was designed by Dean McMullen. The obverse of the coin features two competing players converging on a soccer ball. The reverse of the World Cup Silver Dollar shows the official World Cup USA 1994 logo flanked by laurel branches. The 1994 World Cup Tournament was the XV FIFA World Cup, and it was the very first time that the tournament was held in the United States of America, making this coin a must have for any collector or soccer fan! The 1994-D World Cup USA Commemorative Silver Dollar comes in the original U.S. Mint packaging, with the coin encapsulated by the Mint and resting in a velvet case. Also included are the mint box and Certificate of Authenticity. Don't miss out on this rare 1994-D World Cup USA Commemorative Uncirculated Silver Dollar!